Wastepaper Prose : Nevermore Winners! Congrats to the winners! I had hoped to win that action figure, but I'm sure that whoever won it has big, fun plans for it! Congrats to all the winners! Thanks for another great event at Wastepaper Prose! Thanks! I received by bookmark today! LOL I didn't know I won so it was a nice surprise in the mail today :D Thanks! 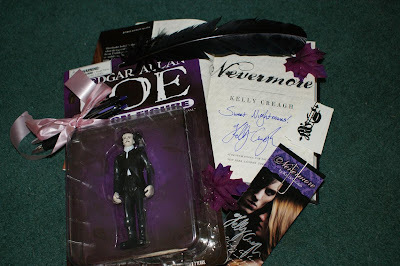 *sigh* I want Nevermore swag so bad but I'm years late to any giveaways LOL That bookmark is so pretty!